First becoming available for home use in the late 2000s, cheap 3D printers have fast become even more affordable and easy to use for personal and small-scale creative projects. 3D printers for the home are a step up from increasingly popular 3D pens, but not quite the same level as the industry standard printers used for larger scale projects. Whether you’re making mockup miniatures for work, creating nifty fixes for household issues or bring your creative projects to a new level, they’re fast becoming an essential item for the home craftsman or artist. While they’re undeniably being used to push the boundaries of innovation in fields such as medicine, they also make for a fun and creative tool for home use. The printers can still come at quite a price, however, there are a number of quality options available to those on a budget, which get the job done well, and still manage to bring your creativity to a new dimension. We’ve compared twelve printers under the price of $500 to bring you some of our favorite most affordable and compact 3D printers around. Below are our twelve picks for the most affordable 3D Printer for homes or hobbyists. The HICTOP Creality CR-10 is our top pick for a printer under $500. Small enough to fit on a desk, and printing within +/- 1mm of accuracy, this is a great pick if you have the budget for it. It uses remote feeding to help the extruder move with more speed and freedom and can print up to sizes of 11x11x15 inches. The ADIMLab 3D Printer is our favorite affordable miniature printer. 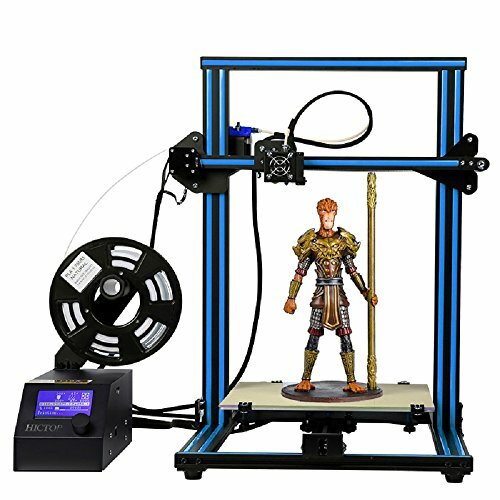 With dual z-axis motors and a dual-track y-axis, it allows for accurate and stable printing of complex miniatures up to 12x12x15 inches. In addition, the printer comes with an array of small handy tools to make the process of printing and cleaning up a lot easier. The Comgrow Creality Ender 3 is the 3d printer of choice for under $300. 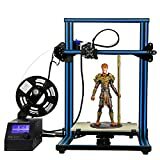 It covers all the bases of a strong 3D printer like a strong extruder, variable print sizes and a clean and accurate finish on the end design. 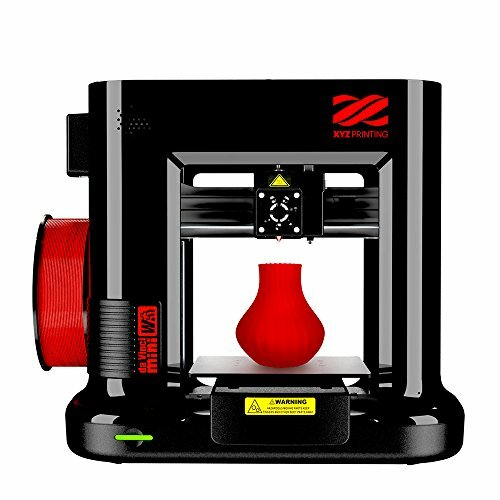 It comes in at a very affordable price and is a great place to start for anyone making their first 3D printer purchase for their home. The TEVO Tornado 3 is our overall top pick for a home 3D Printer. 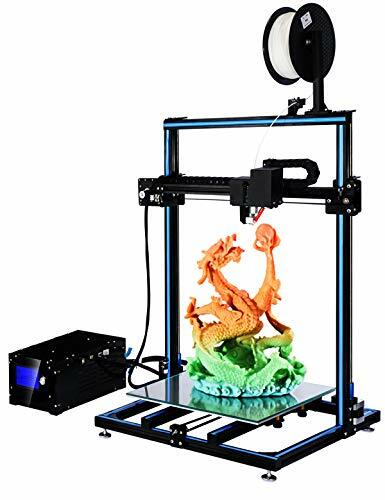 It’s a high quality, durable printer with an all-metal HotEnd allowing for the printing of many filaments, such as Nylon, Polycarbonate, ABS, Wood etc. With a modular design for simple maintenance, as well as a durable belt drive system, it’s a well-made durable printer that will stand up to the most testing of 3D Print experiments. This Comgrow Creality Ender 3 is a great, standard model home 3D printer. Its main feature is the Resume Print technology included, which allows for power to the unit to be cut and restored without issues in printing – the process will simply resume. With a +/- 0.1mm printing precision, and a maximum printing size of 8x8x9 inches, it makes for a very accurate print of objects from a small to medium size. In addition, it’s very easy to assemble out of the box, and you’ll have it printing in no time. The menus on the LCD screen are easy to use, and straightforward, making this a great printer for a beginner or intermediate users. Also supplied are an extra nozzle, scraper and cleaning tool to make the Creality Ender 3 easy to clean and maintain, helping it last longer and in better shape. The FlashForge finder is a sleek-looking, closed model desktop printer that comes with a 3.5-inch full-color touchscreen for easy operation. With Wi-Fi, USB, Flash Drive, and Cloud connectivity, it’s a great option for a printer that’s going to be used regularly and frequently, and even possibly by multiple people. With no assembly required, as well as a slide-in build plate for easy removal of prints, the Finder cuts out a lot of the little efforts and stresses that come with operating a small form-factor 3D printer. The print size limit is 5.5 inches in all dimensions which might not be enough for some but allows extremely precise and clean printing within those dimensions. It also comes with a toolbag and a roll of the PLA filament it prints with. The Select V2 from Monoprice comes at a fantastic price for a very versatile home printer. The heated build plate and extruder allow for use of multiple filament types such as PLA, ABS, dissolvable PVA, and wood or metal composites. It has a desktop-ready form factor, and a printing size of 4.7 inches squared. It also comes fully assembled, making it ready for use right out the box. It comes with a microSD card and a few tools for cleaning and maintenance, and a color LCD for easy access to its settings, print parameters and readings. With fantastic build quality and precision, this is a perfect budget option for anyone with any level of printing experience whatsoever. While the print size and manual calibration may be troublesome for some, these are made up for by the possibility of easily executed complex prints. This ADIMLab printer is a higher end model for the more ambitious printer. It’s able to print PLA, ABS, wood composite, HIPS and a number of other filament materials without issue. It arrives almost fully assembled, requiring less than an hour of setup before you can start printing. With a glass printing bed, a 3 inch LCD display, 4GB SD card, and tools for assembly and maintenance included, it’s a great all-in-one package that has the ability to print up to 4.5 inches per second. Customers also report a great customer service team that’s easily contactable over Skype or email, happy to assist with any questions or requests, such as firmware updates or compatibility issues. With a larger print size of 12x12x15 inches, this is a great model for more strenuous or adventurous home printing projects and comes with a 1-year warranty. The Mini Delta from Monoprice is a small form-factor printer, great for compact print jobs. It features a fan-cooled extruder nozzle with a temperature range from 180-260 degrees, and WiFi, USB or microSD connections. 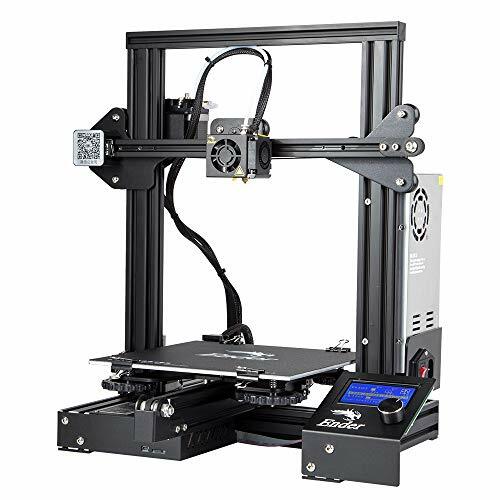 This printer arrives fully assembled and has a steel and black anodized aluminum frame for fantastic durability and build quality. As well as auto-calibration, the printer also has a small screen for settings and configuration, and a heated print bed for open-source style settings for different types of prints. While the print size for the Mini Delta might not be enough for some, the strong build quality and heated bed at such a low price make it the prime choice for anyone looking to 3D print for the first time, to the hundredth. 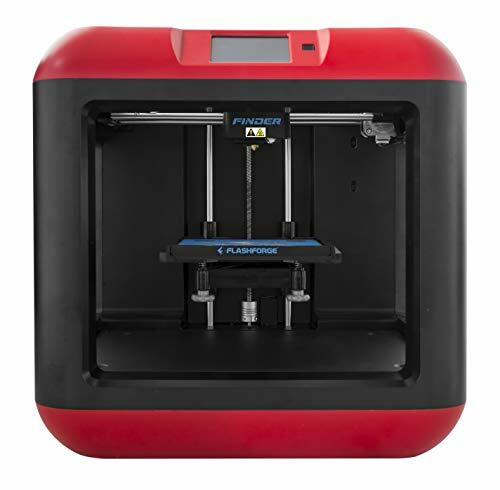 There are also a plethora of resources online in Monoprice’s various active communities, making this printer even more fun to use and experiment with and one of the top cheap 3D printers on the market. Must use cartridges from XYZprinting. The da Vinci Mini wireless is XYZprinting’s smallest form factor printer, perfect for home desktop or workshop use, and is one of the best entry-level 3D printers we could find. It comes in two colors (black and orange) and can print multiple types of PLA filament as well as PETG. The extruder nozzle is also replaceable, with the option of a Hardened Steel Nozzle, which can extend your range of filament materials to metallic PLA and Carbon PLA too. It comes assembled in the box and weighs under 18 pounds making it great for anyone who might need to move around with their printer for various projects. With a decently sized 6-inch print volume, it can also handle sizeable prints with a high level of accuracy and a clean print. XYZprinting also provides access to their online community which hosts thousands of open-source projects which you can download, modify and print to your own liking. The only downside, however, is that you can’t use third-party filaments – all filaments used must be from the company that manufactures the printer. The da Vinci Pro Wireless is a step up from the Mini Wireless model. Firstly, the print size is increased up to 7.9 inches squared, as well as the ability to use third-party filaments – a first in XYZprinting products. With an aluminum print bed to distribute heat more evenly, as well as improved sensors and knobs in the calibration system to more quickly and easily calibrate for different kinds of print jobs. The printer is also fully assembled out of the box, allowing for near out-of-the-box printing. It supports PLA, ABS, HIPS and an array of other filaments, as well as the option of an upgradable nozzle for laser engraving. 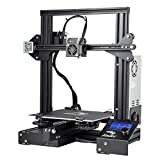 This is a great mid to higher end model of printer for anyone who wants to get a little more ambitious or complex with prints, and get deeper into its configuration in terms of heat, speed or size settings. This TEVO printer the higher end home printer of choice. It’s a high-quality build with some fancier parts than your average beginner printer, but that, of course, comes at a higher price point – yet still a great one. It’s among the top of the best 3D printers 2018 has had to offer. With a print size of 11x11x15 inches, the Tornado 3 can handle slightly bigger prints than most. With a fan-cooled extruder nozzle and modular design for easy maintenance, perfection and quality come first for this model. The silicon print bed is constructed from an advanced mix of a glass covering and insulation cotton. It also comes mostly assembled, which means it only requires a few minutes of setup before you can get printing. The Tornado 3 can handle a number of different filament types such as PLA, ABS, PETG, Wood and a plethora of other materials; as well as supporting USB and SD card printing. It also comes with a number of tools for assembly and maintenance. The GIANTARM GEEETECH A10M is one of the only printers at this price point that supports mix-color printing. With a dual-filament modular extruder and an 8.6×8.6×10.2 printing volume, it’s a fantastic higher-end printer for the intermediate to advanced user. The printer has a modularized design for easy assembly in a 4-step process, and also includes break-resuming capability like the Comgrow Creality Ender 3 – if the power is interrupted in any manner, the print will simply resume once power is restored. The A10M also includes Geeetech color-mixer software, allowing for graded color between selected layers of prints. 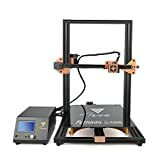 As well as a filament detector, auto-levelling sensors and an open sourced control board (allowing for the more techie users to modify firmware on a very deep level), the A10M has a number of extra parts and upgrades available for order on their website, allowing you to modify your printer to suit the needs and capabilities of your most ambitious prints. 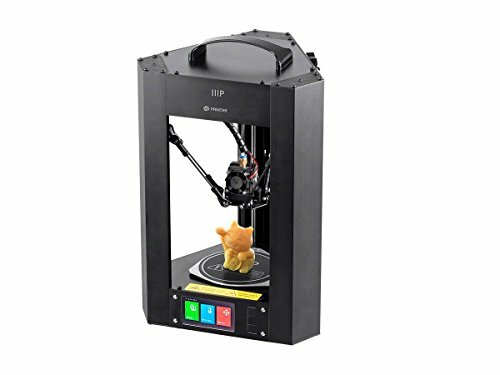 The Full Metal I3 Mega is a larger form factor 3D printer which features a touch LED screen and a patented ANYCUBIC UltraBase, allowing for super adhesion as well as easy removal of the printed model. 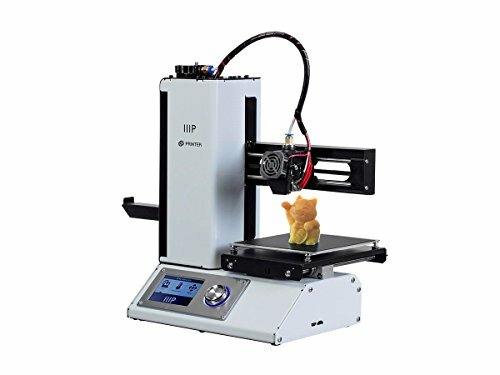 Complete with automatic filament detection, the I3 Mega comes almost-assembled out of the box, merely requiring a four-screw completion, and is compatible with PLA, Copper PLA, TPU, ABS and a myriad of other filament materials. It also comes with an extra extruder and an SD card. With an all-metal frame and parts, the build quality on this printer is fantastic, and setup is quick and easy and can be completed within 20 minutes of unboxing the printer. 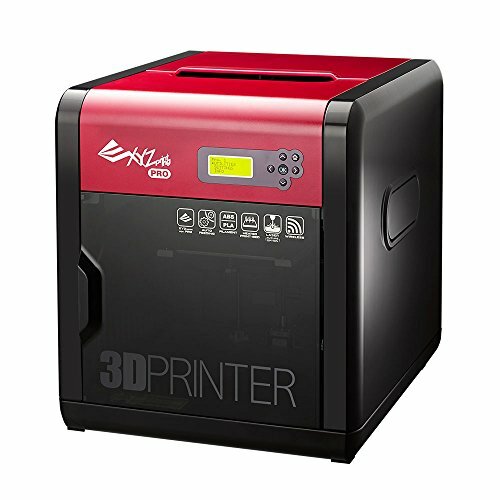 It’s a quality mid-price level printer, perfect for anyone with mid-level experience in 3D printing. The HICTOP Creality CR-10 is a printer that comes in at the higher end of our 3D printer price range and is our top pick for a printer under $500. The high accuracy bearings make for a stable and quiet print, but the form factor is still small enough to fit on a desktop if you have space. The printer uses an all-in-one power supply and LCD control board, as well as an aluminum PCD hotbed with a large 11x11x15 inch printing volume, which can be optionally upgraded to a 19 inch squared volume. Arriving in three parts, the CR-10 is easy to assemble, and every model goes through 2-4 hours of test printing before shipping to ensure quality across all individual printers. The CR-10 uses PLA filament and comes with spare screws, some tools for maintenance and a detailed assembly instruction manual and user manual. 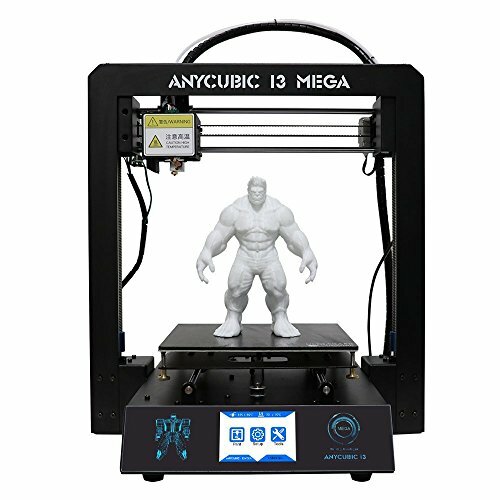 This is a great printer if you’re looking to print larger models and get a bit more complex with shape and detail on a large model. 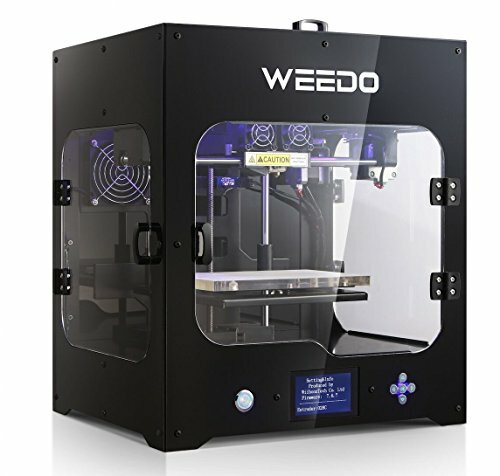 The WEEDO M2 is a high end, small form factor, fully enclosed 3D printer. The case enclosure keeps the noise at a low level, and the carbon filter fan prevents and small dust particles from getting in, or any odors from getting out. It’s definitely one of our top 3D printers under $500. The printer features a removable magnetic print tray that prints to 5.9×5.9×7.8 inches volume, as well as all-new layer printing temperature settings which prevent edge warping issues – a feature very uncommon in most home printers. The speed and temperature can be adjusted at any point during printing, and there is also an automatic power-off function to save electricity. The M2 arrives fully assembled and has been factory calibrated so it’s ready to print out the box. It comes with an SD card with pre-installed models for test prints and comes with boutique software for slicing and precision control. If you’re looking for a printer with a slightly fancier build quality and some extra bells and whistles or looking for something that will outperform your existing home printer, this is the model for you. It’s fast and reliable, and sturdy to boot. The printers we’ve reviewed vary in size, shape, and functionality, but they all serve the same end purpose. It’s important to weigh up which options you really need and which are just extras, but we won’t deny that those extra features can be incredibly enticing and, at times, super innovative and groundbreaking. In short, when looking for a 3D printer for your home, you’re going to want to first tailor it to what it is you want to print, and only then look at extra features and plusses. There are a lot of things to consider, like what kind of filaments the printer supports, what the print volume is and what kind of ease-of-access is included in terms of slicing and interfacing. If you’ve ticked off all the points we’ve listed above when choosing your printer, then you’re well on track to printing your first character model, wardrobe handle replacement, cup holder, or whatever it is that you’ve set your eyes on. PixelSmithStudios is a participant in the Amazon Services LLC Associates Program, an affiliate advertising program designed to provide a means for sites to earn advertising fees by advertising and linking to Amazon.com. Amazon and the Amazon logo are trademarks of Amazon.com, Inc. or its affiliates.